A best luxury brand car in SUV segments has a lot to offer, from its excellent performance to luxurious design and interior, they offer best-in-class of everything. Such is the 2018 Infiniti QX80 SUV which comes with a highly powerful V8 engine, all advanced safety features and top-notch technology features. The 2018 Infiniti QX80 everything to entice luxury SUV enthusiasts and deliver a powerful performance which is promising and thrilling at the same time. This best luxury brand car SUV is a true masterpiece of exceptional engineering and delivers a sharp performance which other vehicles are unable to provide. This luxury SUV has a luxury laced interior, a redefined exterior and modern features and curves from every angle. The athletic and impressive exterior of 2018 Infiniti QX80 adds more grace to the SUV and gives a very long-lasting impression on the onlookers. Infiniti introduced a powerful engine in QX80 2018 enabling it to deliver unforgettable performance on every road condition. Laced with advanced safety features and technologies the QX80 provides comfort, entertainment and sheer pleasure for all occupants. Designers at Infiniti had precisely designed this luxury SUV and design details on each and every part of the vehicle reflect pure elegance with sporting intention. The exterior and interior both look luxurious and attractive demanding another look from the onlookers. The ergonomically designed interior provide optimum comfort and smooth ride to all passengers with plenty of in-cabin space. The aerodynamically designed Infiniti QX80 2018 provides better fuel-efficiency and stability on the UAE roads. The bold front fascia features a honeycomb single-frame grille adding more aggressiveness to its profile. Another addition of chrome strips just above the license plate area and around the grille makes exterior look more premium and prestigious. It has a muscular stance which is widened by the front fenders and large hood of the SUV. The best luxury brand cars have features to impress the enthusiasts making them look more premium and prestigious. The new Infiniti has roof rails, LED running signal, heated power side mirrors and 20-inch alloy wheels fitted with all-season tyres gives optimum performance on different terrains. Also, the luxury brand has introduced automatic LED headlights to provide a clear view of the road to the driver and to the commuters. The LED front fog lights also improve the road visibility even in bad weather conditions. Moreover, the 2018 QX80 SUV also had LED rear lights and a Center High-Mounted Stoplight (CHMSL) enabling approaching vehicles to maintain a safe distance. The best luxury brand car offers luxuries which no other vehicles can compare with and thus they are in the leading position. However, the Infiniti QX80 2018 is one of those brands that offer, style, luxury, functionality and more passenger-centric features in its vehicles. The ergonomically designed interior of this SUV has a spacious cabin, plenty of legroom and headroom, and all important convenience features for passengers to make their rides smooth. Moreover, it has some of the best convenience features such as 9 cup holders, 4 bottle holder, auto locking, rear privacy glass, power windows, power sliding tinted glass moonroof and sliding sunshades. The interior of the Infiniti QX80 is truly beautiful, the fake wood trims and leather-wrapped door panels look very elegant and sophisticated. Also, a noise-insulating glass in windows is fitted to reduce the road noise and ensure a quiet ride. It has a multi-spoke leather-wrapped heated steering wheel with driver’s assistance features, a Tri-zone Automatic Climate Control with Micro Filter system, fine vision electroluminescent gauges behind steering and many other convenience features for the occupants. This luxury brand car has seating capacity up to 8 passengers, and third-row seats feature 60/40 split fold-flat and reclining function to provide more comfort. The latest Infiniti QX80 is fitted with exceptional performance features providing optimum comfort on both on and off the road. It has an independent double-wishbone front and rear suspension delivering a smooth ride on all road conditions and terrains. 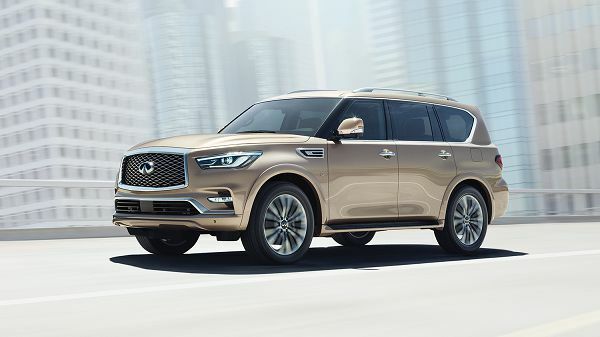 The brand has introduced Hydraulic Body Motion Control System in all-new Infiniti QX80, helping to decrease the body weight and provide more control on the vehicle. The new Infiniti comes with INFINITI All-Mode 4WD System having different driving modes, allowing the driver to choose driving preferences as per their ease. 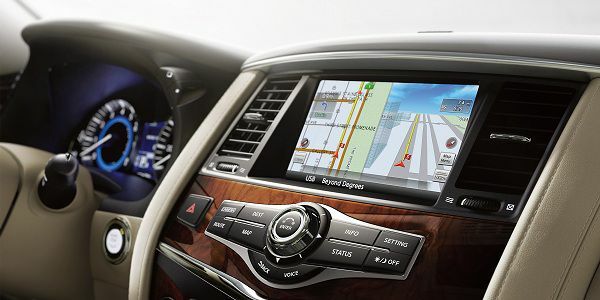 The driving modes available in the new Infiniti are Auto, 4H, and 4L. Moreover, the Infiniti QX80 2018 receives power from a 5.6-litre 32-valve V8 engine paired with an electronically controlled 7-speed automatic transmission. The SUV has an all-wheel drive and the engine is capable of generating 400 horsepower and 550Nm of torque. The 2018 QX80 SUV can go from 0 to 100 Km/h in just 7.3 seconds with a top speed of 200 Km/h. The engine despite being powerful has an amazing fuel efficiency of 13mpg in the city and 19mpg on the highway. 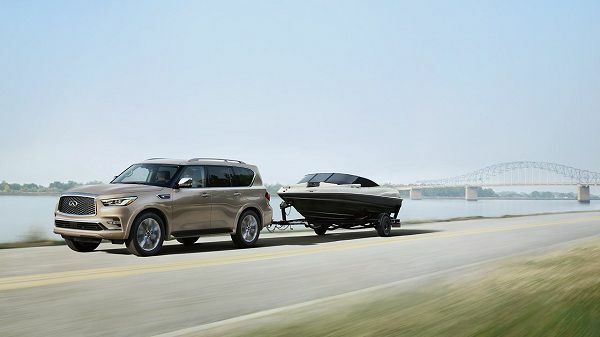 Further, the new SUV by Infiniti has a towing capacity of 8,500 lbs. The all-new Infiniti QX80 is laced with multiple advanced technologies that help driver and passengers to provide a smooth ride on every road. An 8-inch WVGA colour touch-screen fitted in the dashboard allows passengers to have control of different technological functions available in the vehicle. The 2018 Infiniti QX80 is laced with modern safety features helping to make all rides safe and secure for the occupants. 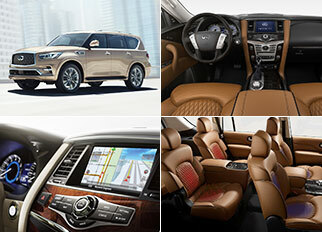 The all-new Infiniti QX80 is available in the UAE market. It has a starting price of AED 307,500 that can go as high as AED 335,000 based on optional features. Being a luxury large SUV it offers a perfect combination of powerful performance attributes and advanced technologies that make every ride comfortable and memorable.